where is peter off to now? If you’ve followed this blog at all, you know that I am a bit of a traveler. 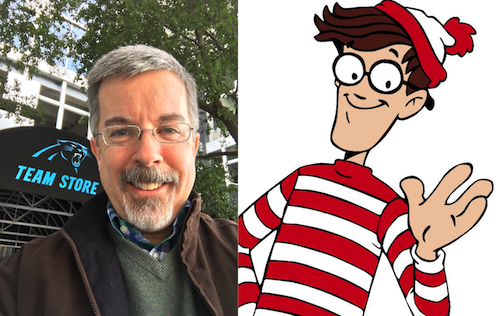 I have happily visited my voice-over friends from around the United States (from Vermont to Seattle) and Canada (from Toronto to, um…Toronto). I’ve even kept a running log of how many states I have stayed over night in all my life and have ONLY 13 more states to go before I will have stayed over night in every state in the Union! But there is a trip planned for THIS summer that will be the biggest trip I’ve taken in decades!!! I will be landing in a place that is familiar but still fairly unknown to me. I expect it will be, quite seriously, life changing. Would you like to go on this journey with me? Stay tuned to this blog all summer long for updates and visits that I will document along the way. I won’t be so much ‘shaking it off’ as I will be shaking it up! Stay tuned and enjoy the ride with me. As with most things I do, this will be fun! 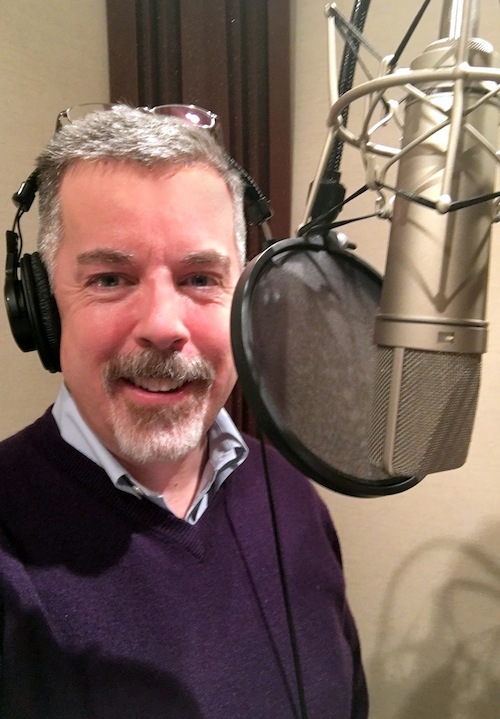 When a voice talent is on the road, there will be voice-over projects that come up. Often times, with my portable rig, I can record in a hotel room or a car and the acoustics will be OK (with help from pillows in the room). But there are other times when you know it would be best to record in a real studio (usually decided by the type of project to be recorded or the client needs/expectations. 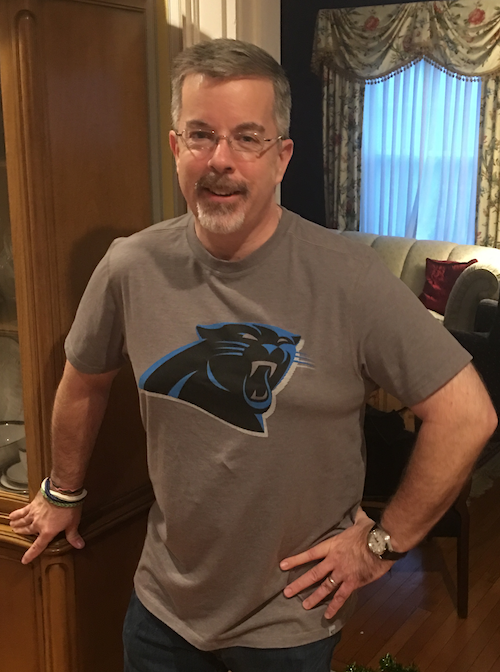 Such was the case today when a new national client needed to record around lunchtime when I was in Charlotte, NC. My rule whenever I travel is to know where the nearest recording studio is in case such an issue comes up (and it WILL come up). Many years ago when she was living in Charlotte, NC, my friend Kara Edwards took me along with her to Groundcrew Studios for one of her recording sessions before we had dinner that night with our friend Bob Souer. There I got to meet Groundcrew’s owner John Causby who was overseeing Kara’s session. Some years later, during a FaffCamp in Charlotte I got to meet the studio’s Senior Engineer and great Sound Designer Ross Wissbaum. Both these guys are real audio pros. This was the first time I was able to record there myself and it was a geat experience. I found out about the recording on Saturday, email John and got an email back on Saturday, worked out the details and it was done. Ross engineered the session which, if you ever meet Ross, means that I’m am going to learn something truly valuable about computers or audio or both. The guy is just a wiz on that stuff and is fun to work with too. Thank you John, Ross AND Katherine! As you can see from the screen shot above and from THIS LINK to my Commercial Voice-Over Demo page on audioconnell.com, my website has new demo players that will make listening to the demos easier and downloading them more effective for producers. This player allows you to listen not only to the entire demo but also individually demo segments – in ANY order you prefer. 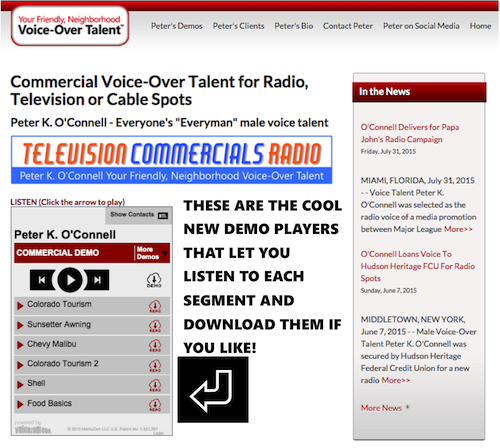 Check out the new voice-over demo players…. PLUS you can now DOWNLOAD either the entire demo or just the voice segment you like to share with whomever is making the voice-over decisions on your media production. 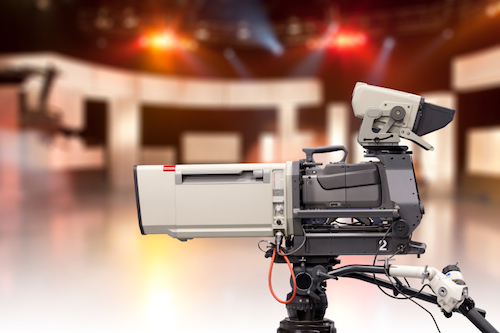 All this will make your voice-over production duties that much easier. This is my new TV Promo Demo. My last voice-over demo for TV promo wasn’t as good as this (I’m not talking about me, but rather the overall quality of the demo). Although I do think I sound better on this demo because I put time and effort in to studying with really good teacher and practicing what I learned. I’m glad I made the investment. peteroconnell.com – i got my name back! Voice-over web domains are funny things and I should know because I’ve had a ton of them. I’d come up with a cool idea and race to get the domain. The hundreds of dollars I’ve wasted on domains was, well, wasted. Some people bought really smart voice-over web domains like Doug Turkel who owns voiceovertalent.com. Word on the street was that he may have had to perform unnatural acts to get that domain…like singing opera during a biker convention in Miami, but that’s just a rumor (that I just started in this sentence). Point is, it’s an awesome domain. But of all the domains I ever registered, the one I could never get was peteroconnell.com. Years ago, I called the guy who had it and we had a very nice conversation…I can’t now even recall if his name WAS Peter O’Connell. He noted at the time he wanted to keep it and I told him to call me if he ever wanted to get rid of it. No call. Fast forward to about three weeks ago and I get an email which smelled suspiciously like spam. It said the domain peteroconnell.com was up for auction and to click here blah, blah. So I emailed my web guy, who just LOVES hearing from me in the middle of of his weekend, to see if this offer was legit. He asked me if I wanted to bid on it? I said I did and I threw out what I considered a low bid. That means I bid too damn high! Anyway, I’ve had peterkoconnell.com for a long time but now peteroconnell.com is in the hands of his rightful owner and all is right with the world. So here’s my question to you: of the web addresses you own, which is your most favorite? Also, which web domain would you most like to own that you don’t own now and why?